One of the top and most premium chairs we’ve ever reviewed, the Ergohuman High Back Swivel Chair is not for the casual user and is more appropriate for executive office settings. This high back chair is the staple high-end solution to most office seating problems. It was designed for workers by health specialists who’ve finely designed every little piece of this chair to be as ergonomic and as healthy as possible. Many see this chair as one of the most adjustable chairs that are currently on the market. You can fine tune it to give you a perfectly tailored seating experience that is personalized to your requirements – and it doesn’t even take very long to set up! And if that doesn’t color you impressed, fret not, as this high back chair also comes with a self-adjusting lumbar support. The lumbar support automatically adjusts its tension, based on how you sit into it. It also features an auto-tilt mechanism on the recliner, which helps move the center of gravity of the chair, based on how far back you tilt it. You can use this Ergohuman swivel chair it for computer gaming but the average gamer in our experience doesn’t have the budget to afford a chair like this. It’s definitely not for the average user and considered a luxury chair for executive users. This Ergohuman chair has the typical mesh look you could expect to see in your boss’s office. While this chair does come at a premium, you’ve got to remember that it comes with the manufacturer’s lifetime warranty. You’re buying an extremely high-end chair that’s designed to improve productivity by having a direct impact on an individual’s health and allowing them to customize and adjust the chair to their liking. We think that this certainly is a very good deal. This Ergohuman chair has a pretty unique design and it’s not something you see every day in a common household setting. This chair has a high back mesh cover and it’s great for allowing a lot of breathing room. 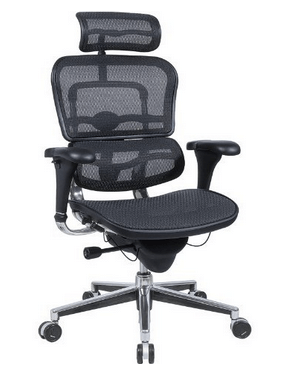 Why do so many office chairs use a mesh design? Because it eliminates a lot of sweating or odor for people who sit at their desk for hours a day. Especially when you’re dressed up in a suit and tie every day, you’re probably going to sweat and these types of chairs are great for breathing room. If there’s one area of expertise we can say that Ergohuman chair nails every time, it’s definitely the durability of their chairs. We’ve never once doubted an Ergohuman swivel chair and they typically go above and beyond the majority of office chairs in the market. The Ergohuman swivel chair could work great as a gaming chair, it’s definitely durable but as we said before, this isn’t something a lot of people can afford and their budget won’t allow for a luxury chair like this. The cylinders, the lift, the base, the wheels and everything else is designed with pure quality. The base of the Ergohuman swivel chair has an interesting dip feature which may not look comfortable to sit in but we can assure you that it most definitely is. What happens when you sit down is, that dip on the seat of the chair will actually even out and work with those mesh holes in conjunction to provide a perfect seat. Essentially the chair will adapt to your body and remove any pressure points that would cut down your blood circulation. There are a lot of areas that can be adjusted based on your height and body weight to make it ideal ergonomic chair specifically based on you and your body. There’s a tilting mechanism that’s synchronized with movement and with the steel base of the chair. Along with durability, everything this chair was designed for, is also for comfort. You can lock in the recline of the chair in three different positions, or use the tension knob to control how easily it rocks back if you don't want the recline to be locked. Whether you are sitting upright or reclining, the Ergohuman seat depth adjustment will make sure your sitting position is correct so your posture is right. The Ergohuman chair will keep you from feeling fatigue from sitting for too long. The Ergohuman chair aren’t the most comfortable things we’ve ever seen but the chair itself definitely makes up for that. Back Angle Adjustability – One of the most unique things about this high back swivel Ergohuman high back chair and one of the most unique things we’ve seen in most high-end luxury chairs is the ability to not only adjust the backrest but you can do it with this chair in 3 different locking positions. This Ergohuman chair has a 3 position tilt-lock function on the chair that allows you to find the perfect resting spot and snap that chair into place, meaning it won’t go anywhere and you’ll be comfortably seated. High-Quality Cylinders – Do you hate in most chairs when you try to raise the chair up and down how it kind of jerks you around or moves real slow? Well, with this Ergohuman swivel chair, you won’t have this issue and it’ll quickly move you up and down to the position you want to be in with an easy-to-press button. The cylinders of this chair were made with extremely highly durable and quality materials. The piston is very strong and won't end up leaking air and having you slowly sink to the point where you need to be constantly adjusting your height. Individuality – We know it sounds weird but the backrest, the headrest, and even the armrests were made so that you can adjust them accordingly. You can easily adjust all of these things to fit your individual needs, depending on what you like and what makes you the most comfortable. 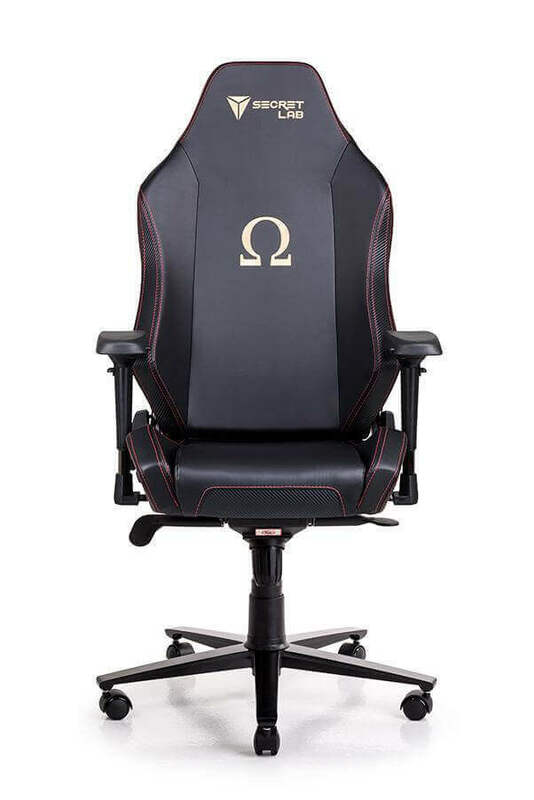 Whether it’s laying flat back, having high armrests or whatever it is that you find most comfortable, this chair allows you to easily adjust to whatever you’re looking for without the complexity that most gaming chairs offer today. Everybody has a different body type so it is great that the Ergohuman swivel chair adjusts to everybody to keep them in the right form. Comfort is also very subjective so having a customizable chair means that anybody can set it up specifically based on their own comfort, and this is what Ergohuman offers . Manageable Dimensions – If you’re looking for a decently sized swivel chair for gaming, Ergohuman swivel chair is the perfect one for you or even if you’re looking for an office chair. The dimensions are well managed and easy to handle as a simple 26 inches by 46 inches for the overall base of the chair. If you’re big and tall or you’re wide or small, this chair will fit you perfectly and you won’t have any issues fitting in the chair. It can easily handle weight up to 250 pounds and maybe even more. Even lighter people will benefit as the cushion will still respond to lower weight users. Assembly - Putting the Ergohuman swivel chair together is very easy and requires no special tools. In fact, there are very few parts that need to be screwed and most of those parts are the armrests. Since all the pieces are lightweight, it can be done by one person. it shouldn't take more than 20 minutes and the instructions are very clear. Eco-friendly - 97% of the material of the Ergohuman swivel chair is recyclable. In a few years time when this chair has given its all and it is time to be replaced, you don't have to worry about it ending up in a landfill. Break it up and put it in your recycle bin for an eco-friendly and sustainable end to your office chair. When looking at the seat pan, what kind of material is back there? The material used on the seating is mesh. This is used widely throughout the entire chair and the arms are simply made of leather, which is smooth and comfortable. I want to use this chair but I’m over 6’ tall, will it fit me? Yes, quite easily. This chair has no problem fitting people who are over 6’ tall and it’s very easy to lean your head back in, even if you’re up to 6’5 tall. It can easily handle a weight up to and possibly over 250 pounds. Ergohuman chair is high-end luxury chair and it’s not for the average consumer. We’ve said that already but we really feel like it’s important in repeating just in case it comes up again. The Ergohuman Swivel Chair with Headrest, Black Mesh & Chrome Base is one of the most solid chairs we’ve ever laid our eyes on and ever had the chance of reviewing personally. It’s a great chair that we’re sure you’ll get many years of enjoyment and comfort out of. While it’s great for the office, the chair can also be used for the home environment such as gaming as well. If the price seems high, remember that this chair will last many years. In the time that you use it, it will be as comfortable as the day you bought it as it has no cushions that will eventually compact over time. As your body changes, it can be adjusted to compensate. You will be using this Ergohuman chair much longer than a cheap office chair and will save money in the long run with this purchase.